Silent Street Photography - Making Street Photography easy. Street Photography has been growing in popularity around the world. It is accessible to everyone, plus its a great way to improve your photography skills. Everyone loves people watching. Whether it be from a cafe or in a park, or even just walking along the street. 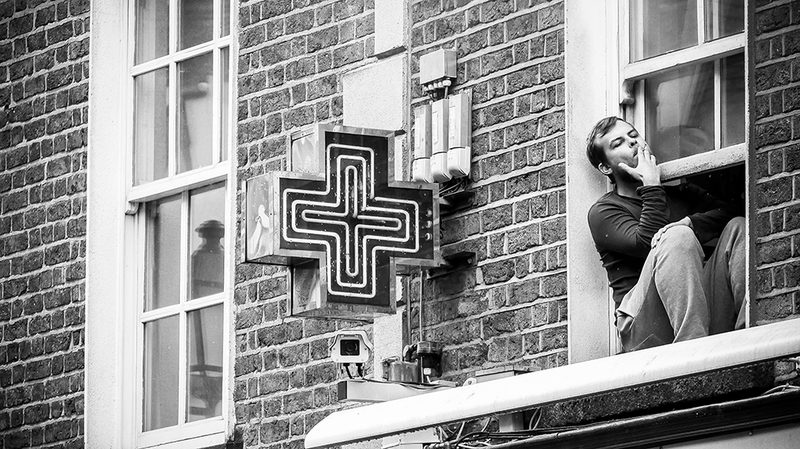 Street Photography makes it even more enjoyable as long as you are considerate about who you are photographing. So recently I have been taking Street Photography one step further, I decided to do 4K Street Photography. If you are not sure what 4K Photography is, have read on my Beginners Guide to 4K Photography. Why on earth would I do this you ask? I decided to shoot in 4K because it is completely silent. Now I know you are saying, well I could just shoot in silent mode for Street Photography. Yes I could, but I would miss key moments that I am trying to capture. 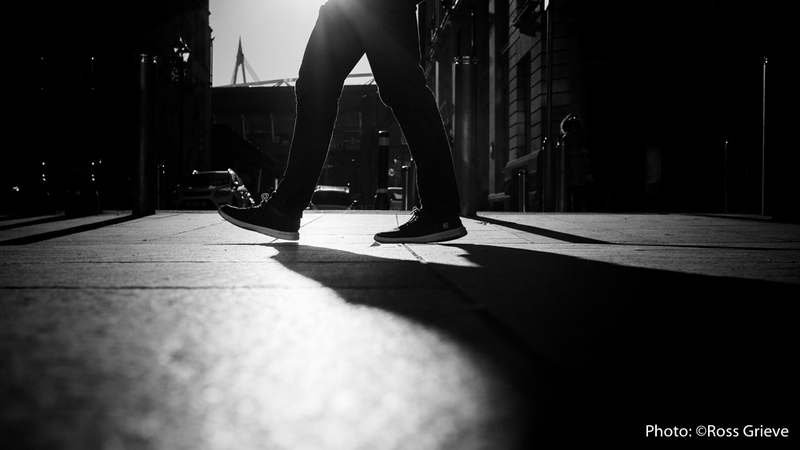 For example this photo taken in Cardiff, I wanted to get a person with the perfect stride as they walked past. So I put my camera on the footpath, with my foot on the strap, and triggered the camera from my mobile app. (Panasonic Image App, free for both iOS and Android). This image was filmed for about 9 seconds at 25 frames per second, and then I knew I had the image I was looking for. You can see the top of the famous Millennium Stadium, in the background. I would have been waiting for longer, if I was shooting traditional stills. Using 4K technology is a great way to enhance and add another tool to your photography bag. I use a Lumix GX8 with a 15mm f1.7 lens as it small and light. But most importantly discreet. This the essence of good street photography. 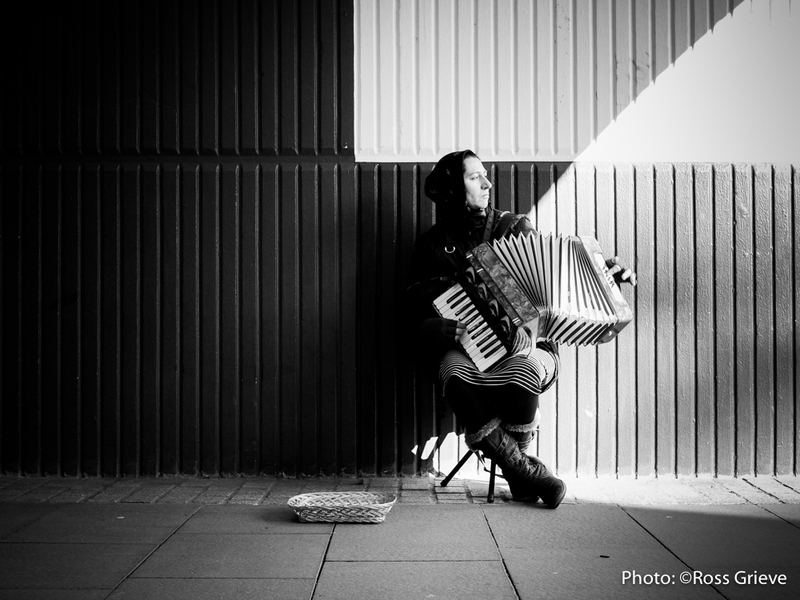 When photographing buskers, always make sure you leave a donation in their collection box. Its how they earn a living and we as photographers should respect that. This next photo was also taken in Cardiff. Its of a lovely woman from Eastern Europe. The wonderful story about this photo is she loved seeing her photograph as no one has taken it before. This photo only took about 5 secs of filming, and I then saved the 4K Photo in the camera, so I could show the subject her photo. The black and white conversion is done in Adobe Lightroom. The photo below was taken in Dublin. Another great city for Street Photography. This was actually filmed in 4K though a window. I wanted to make sure I had the subjects hand up to his face when he was drawing on his cigarette as I preferred this look. Again its about not missing the moment, by exploiting the high frame rate of 4K. This was actually taken on a GH4 (30fps) with a 100-300mm lens as I was doing some testing. So the secret to good Street Photography is being able to be discreet, but not to the extreme where you are spying on people. Always make sure you pay buskers. Black and white works well and it adds a documentary look to your photos, but colour will work in the right time and place. 4K Street Photography makes all of these very easy to achieve. So get out there with and try 4K Street Photography. I use the Panasonic Lumix GH4 and the Lumix GX8. The GX8 with a 15mm lens is my preference.